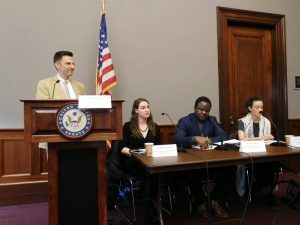 On March 22nd, the Office of Peacebuilding and Policy and the Nigeria Working Group hosted a congressional briefing on the topic of returns to the Lake Chad Basin. 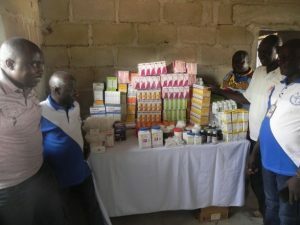 With the Church of the Brethren’s connections to northeast Nigeria, this topic of returning Nigerians to their home regions is very relevant to our work. Accurate and timely information about the situation in Nigeria is essential for quality relevant U.S. policy in the region. Panelists presented on the topic of returnees and garrison towns in the Lake Chad Basin. Photo by Nathan Hosler. The briefing was based in part on a report by Refugees International, one of our partners in Washington, DC that does extensive work on Nigeria. Other speakers included staff from Mennonite Central Committee and Search for Common Ground. 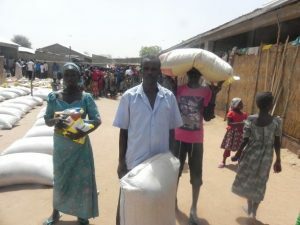 The report addressed the issue of returnees and garrison towns, and gives recommendations for the various actors in Nigeria to mitigate some of the risks that come with the pressure to return IDP communities to their original homes. You can find the full Refugees International report here. One reoccurring theme in the report was the importance of the truth to the success of return policy. First of all, the Nigerian government must provide accurate and timely information on the conditions of regions to which they they plan to return IDPs, and allow the returnees to make the voluntary decision on whether to return to the region or not based on that information. 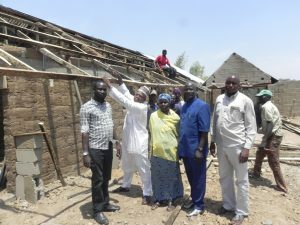 There is fear within the humanitarian community that, because they want to claim successful returns during the upcoming elections, Nigerian officials will force IDPs to return to unsafe areas with inadequate resources and limited accessibility. The importance of truthful analysis of conditions in IDP camps is also essential to a quality humanitarian response. The report highlights the issue of IDP camp management denying psychosocial support and other support services, because those in charge of the camps want to paint a more positive picture of the crisis situation than is accurate. 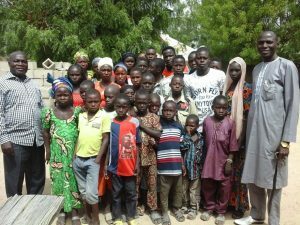 Refugees International makes several recommendations to the Nigerian government, including the adoption of an official policy towards IDPs and the creation of a well-planned return strategy that avoids involuntary returns of IDPs. The report also recommends that donor governments continue funding programs in Nigeria. The Office of Peacebuilding and Policy will continue to coordinate efforts with other Nigeria-focused organizations in Washington, DC to bring these important policy concerns to U.S. lawmakers. The better our policymakers understand the humanitarian and security concerns in Nigeria, the better they will be able to target assistance and peacebuilding efforts in the country. It is important that the United States strive to be a helpful partner to the Nigerian people as they strive towards peace and justice within their communities. Would You go to the Wakanda Workcamp? Whose story would make a great movie? Last week over 25 people gathered to talk about our experiences of watching Black Panther – the ways it was inspiring, troubling, entertaining and thought-provoking. There was a lot of diversity on the call: We called in from across the country and represented many different communities in our denomination. We were college students and District Executives. Some of us are life-long fans of superheroes and for others this was the first time they were watching a Marvel movie. It was a multiracial call –even more diverse if you counted the racial diversity of the families we represent. I want to thank everyone who participated for the open, thoughtful, and respectful conversation. The reflections and questions were profound and often surprising. The conversation returned frequently to the portrayal of violence – the amount of it, the graphic nature of it, who were the perpetrators, how it worked as an allegory, and how it reflects the reality of violence. In many ways, I was reminded that I was having a conversation within a community that self identifies as pacifist. (Though when asked to list our favorite movies, most of them could also be described as violent.) The call ended with reflections on the ways we work to create multiracial communities. 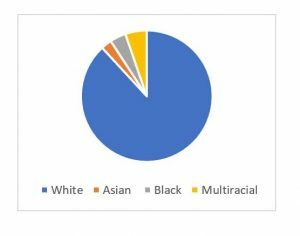 Based on the survey before the call, we are twice as likely to watch a Will Smith action movie than one that reflects on race. 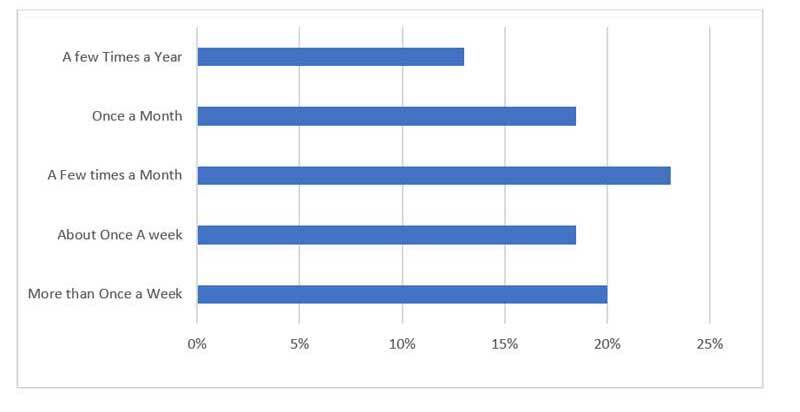 Below are additional reflections based on the survey. Question 2: Which of the following movies have you seen? 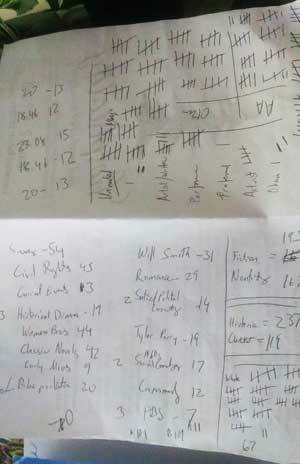 237 responses identified watching historical set movies (Civil Rights Movement or earlier) to current (defined as 1980s to now). 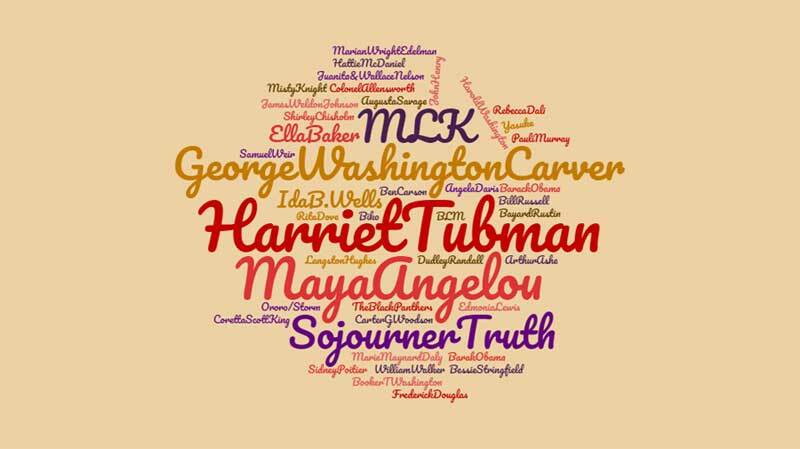 The top four categories coming in at over 40 each were related to Slavery, the Civil Rights Movement, Classic Novels, and Women biographies. 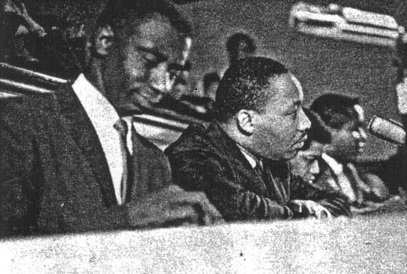 Question 3: Which African American historical figure, book, story, and/or character would you like to see made as a movie? See word cloud above. The larger the text, the more people listed it as a movie they would be interested in seeing made. Question 4: Out of ALL (not just the ones above) the movies you have ever seen, which 2-5 are your favorites? In the interest of space, I would like to say these movies were many and more diverse than I expected. A number of people referenced: Star Wars, Harry Potter, Lord of the Rings. Princess Bride and Selma tied at 5 mentions each. The Butler got 4. Most unexpected to me was Gone with the Wind –three times. Eight people identified Black Panther! Question 5: Please describe your race/ethnicity. Note: Based on self-identification, it was necessary that some counted more than once. by Nathan Hosler. This post is a sermon from the day after the Going to the Garden Summit. Sowing assumes loss but anticipates great gain. In sowing the sower turns over the precious seed to the dark earth. The seed is hidden from light in secret places where worms roam and the mystery of life takes root. This insight, is, however, general. Anyone with experience or basic understanding of plant stuff will get this. Jesus is going beyond. 35 But someone will ask, “How are the dead raised? With what kind of body do they come?” 36 Fool! What you sow does not come to life unless it dies. 37 And as for what you sow, you do not sow the body that is to be, but a bare seed, perhaps of wheat or of some other grain. 38 But God gives it a body as he has chosen, and to each kind of seed its own body. 39 Not all flesh is alike, but there is one flesh for human beings, another for animals, another for birds, and another for fish. 40 There are both heavenly bodies and earthly bodies, but the glory of the heavenly is one thing, and that of the earthly is another. 41 There is one glory of the sun, and another glory of the moon, and another glory of the stars; indeed, star differs from star in glory. Sowing assumes loss but anticipates a harvest. Sowing is the intentional burying of an object that appears dead and then awaiting the pushing forth of new life. The multiplication of the small to the many. Last year, a sunflower seed that sprouted on its own grew to 8 feet tall with well over 100 hundred blossoms from a single stalk. This growth is mysterious, unexpected, almost uncontrollable—yet also fragile, at times easily destroyed, and precarious. However, the seed must be sown, buried, abandoned, set free. Sowing the seed of life is the same. 25 Those who love their life lose it, and those who hate their life in this world will keep it for eternal life. The cost is great but the result surpasses even this. Verse 26 continues, Whoever serves me must follow me, and where I am, there will my servant be also. Whoever serves me, the Father will honor. If one loses their life (either literally or figuratively) as part of a gamble to save one’s life, then it would seem like the point has been missed. “Gambling”, however, even if one’s motive is clear, does not convey quite the right sense. For, to gamble is to bank on chance, which is rigged so that losing is neigh inevitable. Sowing—sowing is much different. Though it is still not guaranteed success, sowing is done out of trust, resolve, skill, perseverance. The sowing is risky, it is an embrace of the unknown. This weekend we held a Going to the Garden initiative gathering in New Orleans. This brought Brethren community-based gardeners from around the country to share of their efforts in dynamic (some might say radical) community gardening. Gardening that confronts the displacement of Indigenous peoples, that builds community, that reveals racism and challenges mass incarceration, that, as one gardener describes it “is growing more than veggies.” For some, the congregation eventually told the pastor that they supported him spending as much time as he felt called in the community gardening. One took a Fed-ex night shift so that the daylight hours would be free to garden. Another stayed in the Lower 9th ward after working in disaster response to the hurricane Katrina. People left home to follow the call of God on their lives. Some envision how it may help to reintegrated formerly incarcerated individuals. (In my description you may hear the strains of the “great cloud of witnesses” in Hebrews 11). A classic text of this giving up of one’s life is Luke 9:23. Sowing assumes loss but anticipates a harvest. Sowing is the intentional burying of an object that appears dead and then awaiting the pushing forth of new life. The multiplication of the small to the many. A defining characteristic of the new covenant inaugurated by Christ is the breaking beyond ethnic and geographic boundaries. In Ephesians 2 we read. These prophecies have a predictive quality but also a visioning function. They shape the imaginations of the people who seek God. In Baltimore there is the American Visionary Art museum. In DC at the Smithsonian American Art Museum at the Ogden Museum of Southern Art in NOLA there are sections dedicated to “visionary art,” These typical include art works—almost always bright, rather wild, often apocalyptic—which are often based on “visions” and biblical texts. Often these “folk” artists labor for years in insolation, creating. Prophecies such as Jeremiah participate in shaping the imaginations of the people who seek God. They shape the imaginations of the people who seek God. This shaping, however, does not mean that the task, the goal, the bringing of the Peace of Christ is simply up to the will of the church nor the will of humanity but is carried forward by the action of God. It is not simply something that we work juuust a little harder to achieve. The Spirit of God carries it forward. Of our Gospel passage in John commentators write, “Thus, ‘lifting up Jesus’ is not something contemporary preachers and Christians are charged to do, but something that has been done by God’s act at the cross and resurrection.” (Craddock and Boring, 330). Our work as a community remains clear: gather to worship God, proclaiming the peace of Christ through word and deed. This ministry of reconciliation seen in 2 Corinthians 5 brings us to reconciling people to God and people to people (as well as all of creation). These prophecies have a visioning function. They participate in shaping the imaginations of the people who seek God.